Dental anxiety is common. In fact, it can be so overwhelming for some patients that they avoid regular dental care and put the health of their smile and overall wellness at risk. This lack of regular dental care can turn a relatively small problem to turn into something more severe that may require extensive treatment. In addition, the stress or worry about dental visits is not good for your mental health. 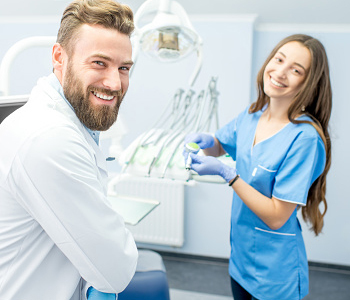 By offering sedation dentistry, we allow our patients to address the anxiety and feel comfortable and confident coming into our office for treatment. By receiving regular dental care, patients put themselves in the best position to maintain oral health. Sedation dentistry doesn’t just help patients who have dental anxiety. Patients who are facing multiple or lengthy procedures may also benefit. Sedation dentistry can increase the amount of dental work that can be completed in one visit. For patients who are undergoing a complete smile makeover, this can allow them to remain relaxed and prevent the need for multiple visits. In addition to the time savings, sedation allows the patients to keep the muscles relaxed, which can help improve recovery by reducing post procedure soreness or discomfort. Patients who opt for sedation dentistry can rest assured that it has undergone extensive testing and has great safety records. Oral sedation is safe and effective and allows patients to have little to no memory of their procedure. If you are in the Boonville, NC area and are interested in reading patient reviews and learning more about sedation dentistry, call Virtue Dental today to set up a consultation. The staff is happy to answer any questions that you have about sedation.